“The exponential growth in the power of silicon chips, digital sensors and high-bandwidth communications improves robots just as it improves all sorts of other products,” writes The Economist’s special report (March 29-April 4, 2014). Three other factors are also at play. One is that robotics R&D is getting easier. New shared standards make good ideas easily portable from one robot platform to another. A robot like Rethink Robotics’s Baxter, with two arms and easy, intuitive programming interface, would have been barely conceivable 10 years ago. Now you can buy one for $25,000. A second factor is investment. (The biggest robot news of 2013 was that Google bought eight promising robot startups.) The third factor is imagination. In the past few years, clever companies have seen ways to make robots work as grips on film sets and panel installers at solar-power plants. Aerial robots—drones– let farmers tend their crops in new ways, give viewers and broadcasters new perspectives on events, monitor traffic and fires, look for infrastructure in need of repair, and more. While society may benefit greatly, robots’ growing competence may make some human labor redundant. Aetheon’s Tugs, for instance, which take hospital carts where they are needed, are ready to take over much of the work that porters do today. Kiva’s warehouse robots make it possible for Amazon to send out more parcels with fewer workers. Click here to watch a great 3 minute video on Amazon’s robots. Driverless cars could displace millions of people employed behind the wheel today. The advent of robots that are cheap and safe enough to be used outside big factories is one reason for a resurgence of interest in robotics over the past few years. Foxconn, a Taiwanese company that manufactures and assembles electronics, is aiming to robotize much of its operation with hundreds of thousands of its own relatively cheap Foxbots. 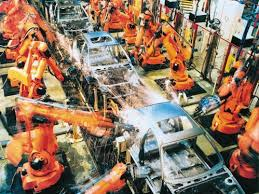 Car companies use the lion’s share of industrial robots; they account for over 50% of robot installations in the U.S.